About: Bernd Marquart´s father brought the music of Louis Armstrong from the American POW camps to Germany. A jazz life began as young Bernd listened to, then fell in love with Armstrong's music. Bernd started piano lessons at age seven, then trumpet at age 14. He formed his first band when he was seventeen, moved to Stuttgart the following year and was immediately hired to play with the bands there at age 18. A cool career - just like his music. Marquart´s musical development reached it´s first highpoint as he began performing with the Bireli Langrene Ensemble. Concerts in New York City, sessions with Jaco Pastorius, national and international tours followed. Bernd continued to expand his repertoire, playing bebop, hardbop and cool jazz styles. 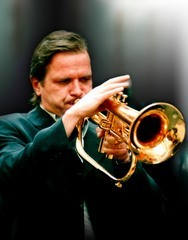 In 1987, he began music studies in trumpet at the Staatlichen Hochschule für Musik und Darstellende Kunst in Stuttgart. Two years later, he began work on a student exchange program between the Musikhochschule Stuttgart and Western Illinois University in USA. During his six-month stay, Bernd met the American pianist and singer Ellen Peters and invited her to visit Germany. Bernd Marquart and Ellen Peters Marquart have been performing together since 1991.